This month for Let's Lunch, our group decided to post recipes from our grandmothers to honor our friend Pat, whose book The Asian Grandmothers Cookbook came out in paperback recently. What I like about this book is that it's a great primer to Asian cuisine. Pat includes a sections on techniques and common ingredients in addition to the great recipes. I felt like a kindred spirit to Pat reading the introduction of the book, growing up in a country away from her heritage. Like Pat, I also learned to connect with my culture through food, she via her mother, me via a mishmash of culture camps, dance moms and later, blogs and YouTube videos. I grew up far away from all of my grandmothers. My paternal grandmother died when I was very young, and we lived halfway across the country from my maternal grandmother. I only met my Korean grandmother a handful of times before she passed away last year. So, needless to say, I'm not exactly a wealth of family recipes. My favorite recipe from my Nan is her Irish Soda bread, which I posted last year for Cheryl's Family Recipe Day. I've made this bread time and time again since first receiving the recipe for it in college. 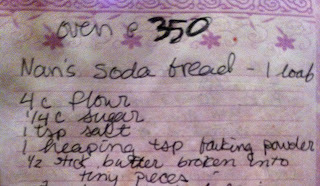 The oven temp is boldly written at the top of my recipe book page because the first time I made it, I misread the emailed instructions and baked my bread at 450 for an hour. Not quite "burnt" but definitely tougher than expected. I didn't spend much time around my dad's mother -- in fact, I'm not sure I can even remember having a meal she cooked. But I know that she used to cook Polish food, a nod to a small slice of her heritage. Two years ago, I jumped at the chance to head north a day early to help my aunt make stuffed cabbage rolls and pierogies for Easter. I had never gotten the chance to do this with my Grandma, but this was the best substitute I could have had. And, being an adoptee who has searched for and found my biological family, I'm in the strange position of having had three grandmothers during my life. My wei-halmonie, my birth mother's mother, first came into my life in 2005 when I went on my first trip to Korea. She made dinner for my mom and I when we went to visit the family's home in Inchon. The dish I hoped to someday learn to make is captured in my chopsticks above. I'm not entirely certain sure what they are called, but they're sort of a small, Korean vegetable/fish pancake thing. They're about the size of a silver dollar and awesomely delicious. Next time I'm in Korea, hopefully someone in my family can teach me how to make them, since my halmonie passed away last spring. I'm also hoping to learn the name of these yummy nibbles. So, cheers to our friend Pat and do check out her awesome book, The Asian Grandmothers Cookbook. Check out the rest of the Let's Lunch posts today by following the hashtag #letslunch on Twitter or clicking through below. If you would like to join us next month, send us a tweet introducing yourself! I'm @emmacarew on Twitter. amazing post and amazing women who created you & led you to be all that you are! Hugs!! How lovely to have three grandmothers,and three cultural traditions you can call your own. What a treasure to have three grandmothers! Pierogies! My grandmother's recipes are comfort food too. Neat that you have such a variety of inherited cuisines to choose from! Thanks for the sweet comments, Karen, Linda, Renee, Lucy and Annabelle! Happy LetsLunch! My heart races a little when the Sur La Table and Crate and Barrel catalogs arrive. I love to browse kitchen aisles in stores and websites, dreaming of my perfect kitchen. Always trying to get creative with my very tiny kitchen space. Copyright Emma L. Carew 2010. Simple theme. Powered by Blogger.